I came across your company [replace with the actual company name if known in advance] during my search for the leading and prestigious companies in the field of business planning and development. I am very impressed by your organization’s wide industry exposure and I am very interested in exploring a possibility to join your team. I'm responding to the job Advertisement no. 42137 that was published on 19 April for Business Advisor. This could be the end of your search for the right contender because my experience and credentials are precisely what you are looking for. Devoted Business Advisor with a long and prosperous history in increasingly responsible positions within the Business Planning field, gaining extensive experience through working with greatly qualified people. My greatest strength lies in my ability to communicate with all types of people and different levels of professionals. You and I haven't spoken before but Mr. Jones thinks we might have an interesting conversation, especially if you anticipate the need for an industrious young Business Advisor who comes equipped with a great education and a great desire to start at the bottom learning from an acknowledged master in the field. Currently, I am examining opportunities in the Business Planning field where I can contribute in the role of Business Advisor. I have a Bachelor's Degree in Business Planning and three years' experience in the Business Planning field, serving in varied roles, slowly but surely climbing the career ladder. I have consistently received the highest ratings in my branch despite the fact that hard problems frequently find their way to me. Should any questions arise regarding the info on my CV, or if you need personal references, please do not hesitate to contact me through the address or telephone number listed above. Thank you for your time and consideration. I look forward to meeting you. If you are currently searching for a capable Business Advisor for one of your numerous clients, then I think that you need to take a look at my resume because you may just find exactly what you are looking for. A well-qualified Business Advisor bringing over five years of Business Planning experience. The scope of my experience includes, but is not limited to: ________. My focus is to deliver results and provide superior service by quickly identifying issues and developing a solutions to ensure they are resolved. My expertise lies in my robust ability to build rapport with others and manage all aspects related to my appointed position and areas of responsibility. I find these qualities to be my greatest assets to offer employers. I have enclosed my CV for your review. Should you be conducting a search for someone with my background at the present time or in the near future, I would greatly appreciate your consideration. I would be pleased to talk about my background more totally with you on the phone or at a personal interview. As a Business Advisor, I have built a reputation for my solid capability to provide exceptional performances due to my well planned education and ambitious nature. My ability to pinpoint challenges and to capitalize upon opportunities has been one of my strongest assets to my employers. My thorough understanding of the Business Planning domain has vastly contributed to my career and success. I maintain self-confidence, credibility and stature to make things happen with coworkers inside and outside the company. Just as significant are my abilities to develop rapport among co-workers and management, build effective teams and promote team effort. I am very interested in joining your team as a Business Advisor or similar role that fits my qualifications. I would very much like to discuss career opportunities with [ABC Inc]. I will be calling you within the next few days to set up an interview. In the meantime, if you have any queries I may be reached at the [mobile]. Thank you for your consideration. 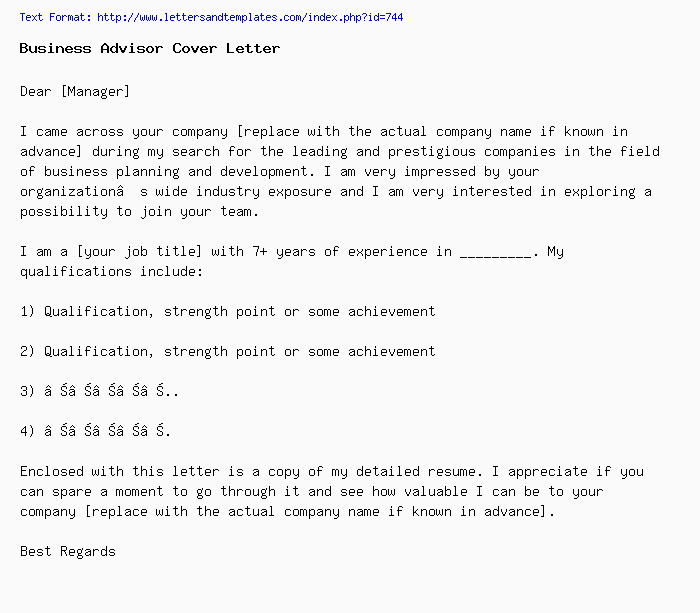 This correspondence is to express my interest in working for your well reputed company in a Business Advisor role or similar. Over the last three years, I have gained beneficial knowledge and experience in numerous facets of Business Planning. With my considerable energy, drive and capability to work long hours, I hardly ever fail in accomplishing my goals and that of the organization. I would appreciate the opportunity to meet you to discuss your goals and how I can help you meet them. I will call you soon to organize a meeting. In the meantime, please feel free to call for further information on my background and experience. Thank you for your attention and reply. I look forward to meeting you in the near future.